….tiring and exhausting, but simply amazing. In the morning at the Social Security Hospital (Nueva EPS) close to where, once upon a time, my mate Paul & I rented an apartment, in Los Cambulos. 18 months ago (I mentioned this in an earlier post), the hospital Director asked if we’d pray for her and her staff. All the other Social Security hospitals have closed, or will close this month. This one is prospering…. …then on to lunch with the wonderful pastors William, Hendrik, and Wilmar to discuss more – many more! – opportunities to preach, pray, share, and give away what God’s given to us. William Castano Baron is a highly regarded pastor in many South American countries: Hendrik, too, especially in Bolivia and Curacao. Wilmar pastors ‘El Abrigo’ church, and is, genuinely, one of the loveliest men I’ve ever met. Wonderfully for him, but sadly for us, Hendrik heads off to Bolivia Thursday with his wonderful wife Teija. This evening, we were in one of the cities highly dangerous barrios – Simon Bolivar. To be honest, if it had been ANY other church than the one were scheduled to go to, I might have stayed home, as my knee has been….er….awful (and more!) today! But Nacer de Nuevo (New Birth) church, an AOG church, is so lovely, I had to go. Pastors Hernan & Aida (Helchie) Gonzalez are amazing. I first went to this church maybe 3 years ago: poverty stricken area, there were 8 people there, including the 3 people I’d taken, and me. Last year, there were 18. Tonight, there was a congregation of between 80-100. Still poverty stricken, Hernan & Aida run a little street stall to generate some income for them, and their lovely son Hernan the third, and, as God has blessed their church, so he has blessed the stall. BUT… success in the streets means they have attracted the interest of the drug gangs/siccarios (cheap hired killers), who want ‘protection’ money, and a cut of their income. To put that threat into context, Pastor Walter Torres was driving through that area a couple of months back, and an old couple stepped off the pavement, into his path, and stopped. He stopped, obviously, to avoid hitting them: at which point 5 young armed thugs appeared, and while one held guns to the heads of the old people, they robbed Walter…. Tonight, at least 15 gave their lives to Jesus. Dozens were healed, and, in line with God’s ‘game’ with me, I got the ‘knee’ people! 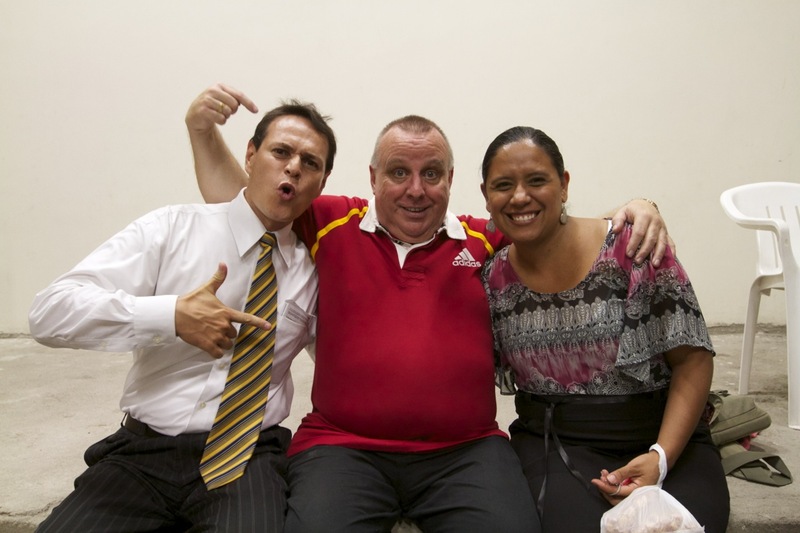 Two crippled elderly ladies, both with acute osteo arthritis, had their knees totally healed, and all pain went…. I almost asked them to help me get up from the edge of the platform…;) Lee saw someone with a frozen shoulder healed, Chris and Katie – and Lee & I some more – all saw people healed. Hernan & Aida were deliriously happy, so were we! Looks like one or more of us will be back there before we go home…. And tomorrow, Benny arrives: so looking forward to seeing him, it’s his first time in Colombia, and South America, I believe. God things are going to happen, as God has miraculously provided the means for him to be here. And….finally tonight…. I still have to pinch myself, even after 49 visits, that I’m in Colombia, high up in the Andes, and having the utter blessing of seeing God move…..